The Building Envelope page describes the part played by a high-performing building envelope and includes a video commenting on the windows. The Comfort Performance page presents analysis and feeds from internal temperature sensors that show how the house performs. Views of the inside to provide passive security. It is important to optimise the window-to-wall ratio of a building to allow sufficient daylight, solar gain, and views without compromising the thermal performance of the building. Glazing will provide good solar gain on sunny days in winter but will also have the highest thermal conductivity, so is a weak point for heat loss. It can also result in too much solar gain in summer that can lead to overheating if shading and ventilation are are not used as control features. We investigated various window-to-wall ratios using thermal modelling and came to the conclusion that an overall building ratio of around 30% was optimal for thermal performance. The following three performance characteristics of windows then informed the planning and selection of windows in the house. North. We have maximised glazing on the north elevation to allow good solar gain during the winter. Northern (midday) sun is controlled with the use of overhangs as detailed on the passive heating & cooling page. East. The eastern elevation has the-second highest percentage of glazing to encourage heat build-up over the day in the winter. We are considering the use of vegetative shading to control solar gain on this elevation during the summer months. South. The south and west elevations have the least glazing. The south elevation will be the coldest and therefore higher levels of glazing on this elevation lead to greater heat loss. However we have optimised the level of glazing on this elevation to allow sufficient opening windows for good cross ventilation, natural ventilation of bathrooms, daylight access, and interaction with the street. West. 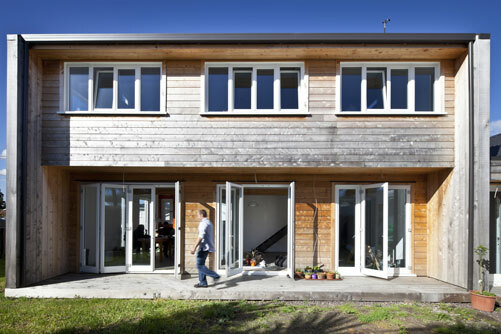 The west elevation will be exposed to strong afternoon summer sun so minimising the glazing on this elevation helps to reduce solar gain in the warmest months. South side of the house, showing reduced glazing area to reduce heat loss. North side of the house, showing larger area of glazing in order to maximise solar gain. All of the glazing throughout the home is the Climaguard N70 product from Metro GlassTech. The N70 product is double-glazed, argon-filled, with a non-reflective Low E coating. Windows with N70 glazing perform extremely well, and the glazing is one of the products that allows us to live in the Zero Energy House without any heating. The table show the R value of a window is determined not just by the glazing but also by the window joinery. Timber increases the R value of a window over standard aluminium joinery (thermally broken2 aluminium will also improve the R value over standard aluminium). Double glazing adds an air gap between 2 panes of glass and, because air is a poor conductor of heat, this increases the thermal performance of the window. Low E coatings1 reduce the amount of heat that is lost via radiation. Up until late 2009 it was easy to get single glazed domestic buildings through consent. Changes in the building code have made it much harder for single glazed buildings to pass and generally most domestic buildings now require double glazing. This is a positive step, however shading should also be included to avoid overheating and the increased use of heat pumps for cooling which is becoming increasingly become commonplace. We concluded that the additional thermal performance of double glazing with a low E coating (to reduce radiant heat loss) was worth the investment. In combination with passive solar design and good insulation levels we are expecting to be able to live in the house without the need for heating. North side of the house, showing some of the upstairs are tilted inwards for ventilation. The full-height bifold windows downstairs can also be tilted inwards. The third function the windows perform is ventilation. The window design we've chosen allows them to be opened inwards at both the sides and bottom. The bottom-hinge means we can tilt them back to allow ventilation closer to the ceiling level where it is needed most (hot air rises). They're also secure in this position so we can ventilate the house while we're not there. And, finally, their angle of tilt and placement underneath the first floor overhang means they can be left open when it's raining. To avoid heating the house we've installed high-performing windows throughout the house. The glass used in the doors and windows is a 24mm double-glazed, argon-filled product called ClimaGuard N70 from Metro GlassTech. The N70 product offers Low E thermal resistance, trapping heat inside the house during winter and reducing heat gain during summer. Many other Low E glass products suffer from hazing or reflectivity that distorts the view through the glass. ClimaGuard N70 is manufactured in a way that avoids these effects. The N70 glazing is one of the key features that allows us to live in the house without mechanical heating or cooling. All of the doors and windows in the home have timber joinery, for the performance reasons outlined above. The windows have been constructed by Heirloom Joinery and feature a dual tilt mechanism. This allows them to be either opened on a side hinge like a normal window or tilted back on a bottom hinge, providing ventilation when needed. The thermal performance of the timber joinery and ventilation control offered by the dual tilt mechanism also contribute to the house being comfortable all year round without the need for heating or cooling. 'Low E' is an abbreviation for low emissivity. By coating the surface of glass with a low E coating the amount of infrared radiation lost out through the window can be reduced. Aluminium is a very good conductor of heat meaning quite a lot of heat can be lost through an aluminium window frame. The window frame will also be colder because of this and you will often see condensation forming on the inside of aluminium joinery when its cold outside. To reduce this problem a plastic separator (plastic being a poor conductor of heat) is placed between the inside and outside of the aluminium frame, reducing the amount of heat lost through the window frame.